In one Norse edda (a collection of poetic folk tales), the gods attempted to shackle the great wolf Fenris, but no chains could hold him. So it fell upon the dwarves to fashion an enchanted ribbon known as the Gleipnir. The gods tried to trick Fenris with the ribbon, claiming it was an adornment. But Fenris was wise and suspected trickery, so he said he would wear the ribbon only if one of the gods placed his hand into his maw. It was Tyr, known for his courage, who agreed. When Fenris was bound, he clamped his jaws, ripping away Tyr's hand. Fenris will be bound until the day of Ragnarok - the doom of the powers, at which time Tyr will fall to Garm, the guard dog of Hel. 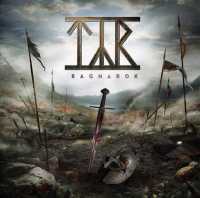 It is this story that Tyr tells in the band's latest release, the concept album Ragnarok. Like the band's previous release, Eric The Red, this release is musically similar. Heri Joensen's vocals are stronger than ever, his soaring voice carried along the four winds. He and Terji Skibenæs continue to craft some excellent guitar riffs, this time tapping into another powerhouse, the new wave of British heavy metal, for added punch. There are also some effects on this one - they are used to set the scene and are quite effective. The band also indulges in more instrumentals, such as the opener, The Beginning, and others, all of which are used to bracket the sections of the tale. Lyrically, the band covers quite a bit of territory, covering all facets of the Ragnarok myth, from the envy between Odin and Loki (Envy and Brothers Bane) and the joining of the Jotuns (the giants) and the inmates of Hel (The Ride To Hel) to the final battle and its potent aftermath. The core theme of the tale is made evident on the track Wings Of Time, when Heri speaks the line, "one thousand years to face your fears." This line is the essence of Norse folklore: all the players in Ragnarok know their fate, and yet they defy that very fate until they are dead. Lyrics are once again in English and the band's native tongue. Bands like Rhapsody, HammerFall, and Kamelot are leaders in the epic-metal genre, and yet the one principal weakness of these bands is that they often indulge in fantasy worlds - worlds that are sometimes described as a bit too cheesy. Tyr follows a similar sound, but the authenticity of the concepts the band writes about cannot be easily dismissed and are definitely not cheesy. Tyr is the real deal.